Papaya plants (Carica papaya), commonly referred to as trees, are actually very large herbaceous perennials, usually with a short life span (but capable of living up to 20 years). 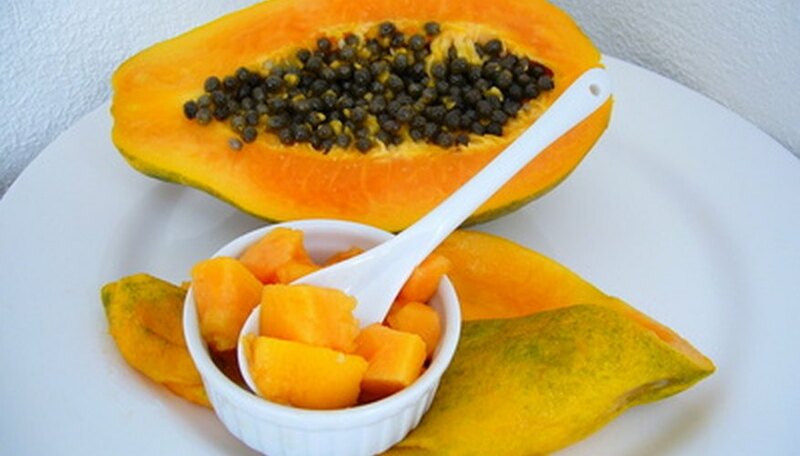 Papayas produce large fruit with very sweet, yellow to red-orange-colored flesh. They are not difficult to grow when given a site with full sun and excellent drainage. Adequate space for development is important because papaya plants are capable of growing 33 feet tall. Papaya plants will not tolerate cold weather; therefore, papaya cultivation is limited to South Florida. Excessive winds hinder papaya plant development, and several insect species commonly attack papaya plants grown in South Florida. The papaya fruit fly (Toxotrypana curvicauda) lays eggs through the skin of papaya fruit. The larvae develop inside the cavity, ruining the fruit. The papaya fruit fly looks similar to a wasp, with its long abdomen and black and yellow markings. Premature fruit drop and yellow areas on the fruit are a symptom of fruit fly infestation. Control measures for papaya fruit flies include covering the individual fruits with paper bags during fruit development as well as removal and destruction of prematurely dropped fruit. The papaya webworm (Homolapalpia dalera), also known as fruit cluster worm, damages papaya fruit by causing injury to the fruit and stem and allowing introduction of fungal disease, such as anthracnose. Papaya webworms develop under a web growing around fruits and stems of papaya plants and are controlled with a pesticide known as Permethrin. Successful reduction of webworm can also result from the use of malathion or Bt (Bacillus thuingiensis, a soil dwelling bacterium used in pest control). Always follow label instructions carefully when using pesticides. Papaya whiteflies (Trialeuroides variabilis) are small, white insects that lay yellow, oval-shaped eggs on the undersides of leaves, and in the crawling stage, develop and feed. Swarming whitefly infestation is evident by shaking the leaves of the plant. Generally, damage results in leaf loss and fruit reduction. Also, whitefly “honeydew” (insect excretion) invites growth of sooty mold. Pesticides and infested leaf removal will control papaya whitefly.